We went out to check the coffee land a few days before Christmas. This year the crop will be small, and late. The first picking, in particular, is small. 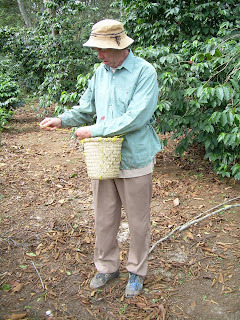 There will be more on the second picking, assuming the remaining beans mature after the poor autumn -- which was mainly rain. Our small coffee block was in excellent shape, with Gabriel having employed a new base worker for the three properties. Goyo comes from one of the nearby ranchitos and works 6 days a week from 8 until 4. His work on the land has been inspiring. The trees are all nicely mounded with composted material and the areas between the trees lovely and clear. In addition, he has cleared a square of land that will be used to build the workshop/toolshed, together with a small dwelling (eventually), a covered cooking and eating area, and a generous courtyard and garden. Gabriel had planted some bananas, there was a new well, and everything generally looked wonderful. 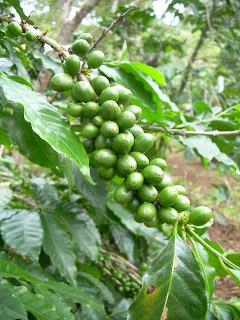 We picked our coffee almost all of Christmas Day. The following pix capture the land and some of the picking. Goyo and I picked half of Gabriel's crop a few days later and will finish that and then we will process the lot and split the spoils with Gabriel. We'll follow the process through as we move into January. Meanwhile, here are some shots from Christmas Day.